Mayor of Istanbul Mr Kadir Topbaş announced the new 5 metro lines to Istanbul. The mayor of Istanbul Metropolitan Municipality Mr Kadir Topbaş announced that the tender process for 5 new subway lines in Istanbul was now completed . He said the the contract for the 5 new metro lines is about to made offical and in the process of signing the contract. In the near future we will also do the foundations together . 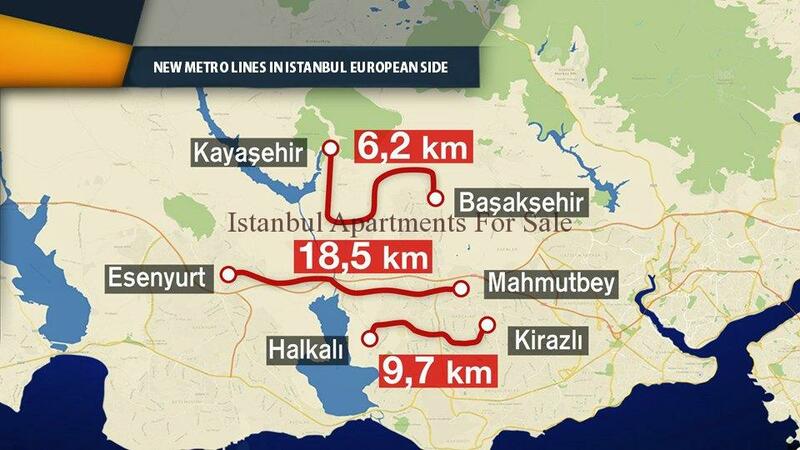 Actually 6 metro lines are awaiting because one of them has been challenged. The contracts for these 5 subway lines are about to be signed and we will soon assign the bases . Thus, by the end of 2019 400 km of Istanbul’s rail system will be brought to our period. The new metro has the most advanced technology in the world says Topbaş. ‘’ We talked about multi-technological structures, we talked about multi-technological systems, we talked about trying to use the most advanced technologies ‘’. In terms of safety of Üsküdar-Ümraniye-Çekmeköy line, we made it more safe it is without driver. It’s a very advanced technology, the world is going through. This is the first time in Turkey and also the case in Istanbul. Test drives are done right now. When it is concluded, we will take it to the service of Istanbul residents when security limits are determined.. Topbaş continued his speech “ We took the 45.1 kilometer road system in Istanbul to 150 kilometers.There is also a 180 kilometer subway line that is under construction.’ Kadir Topbaş, 14,3 km Dudullu-Kayışdağı-İçerenköy-Bostancı, 18 km Mecidiyeköy-Kağıthane-Mahmutbey, 6,5 km Mecidiyeköy-Kabataş, 10,1 km Eminönü-Eyüp-Alibeyköy, 13 km Ataköy-Basın Ekspres-İkitelli Construction of 99,7 km rail system including 20 km Üsküdar-Ümraniye-Çekmeköy-Sancaktepe subway is underway. Kadir Topbaş stated that Üsküdar-Çekmeköy Metro will open 9 stations between Üsküdar and Yamanevler in May. Kadir Topbaş stated that on 30th August the entire line will come into service. ‘’ We also made an auction of our two lines which will be the continuation of this line. 6.9 km Hastane-Sarıgazi-Taşdelen-Yenidoğan and 10,9 km Çekmeköy-Sancaktepe-Sultanbeyli Metro Line. This line will reach Sabiha Gökçen Airport. In addition, 9,32 km Sefaköy-Halkalı-Başakşehir Havaray Line and the bases of Kayaşehir metro wll be deposited. We are making a subway Ümraniye to Göztepe. 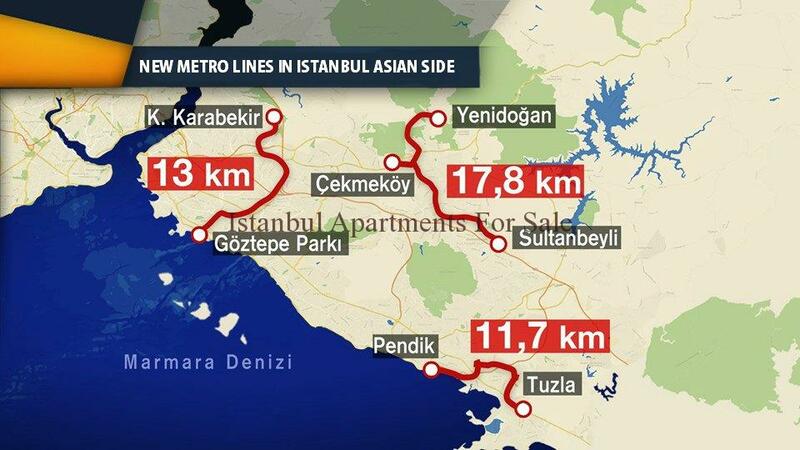 One of the subway projects we care about is the line that will go from İncirli and Göztepe to Kadıköy. We have an important transportation project for Istanbul transport, an 87 km long project. By the end of 2019 , the proportation of tracked systems will reach 28 percent. This is an important figure, so we leave behind London and Paris.Where there is a need for density in Istanbul, we try to put these systems in place. There is a metro from Gayrettepe where the Ministry of Transport is making the point of accessing the city from the Airport. In addition to this we have Vezneciler to Arnavutköy and the third airport will have a subway line ‘’he said.